Nystagmus is an involuntary swing-like movement of the eyes, causing the eyes to move rather than staying still to focus on a particular object. It usually is present in both eyes, but sometimes can only affect one. There are two main types of nystagmus, congenital/early onset and acquired. 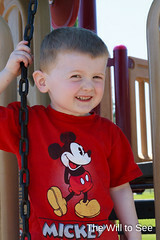 Will has congenital nystagmus. In congenital/early onset, babies can have nystagmus present at birth or it can appear in the first few months of life. Will’s started at about four months of age. Most cases of congenital nystagmus are caused by some other vision-related condition such as albinism, congenital cataracts, or optic nerve hypoplasia. About 1 in 1000 children have nystagmus. Most cases of congenital nystagmus are pendular where the eyes move back and forth evenly like a pendulum. The speed and length of the oscillations can vary depending on stress, fatigue, direction of vision and distance of vision. The farther away an object is from the patient the harder it is for them to focus on it. We notice that Will’s gets worse when he is in an unfamiliar place and he is looking for something across the room or far away. Children don’t typically notice that their eyes move, therefore it usually doesn’t give them a feeling of constantly being in motion or having shaky vision. Many children’s nystagmus actually improves through childhood. Will’s has been getting better. There are times when his eyes only move a small amount. It is unclear whether the condition is lessening or he is learning to dampen the movement. Acquired nystagmus is typically due to another neurological condition such as head injury, multiple sclerosis or brain tumor. Patients with acquired nystagmus typically notice the eye movements, causing dizziness or vertigo. Eye movements with acquired nystagmus are usually directional, meaning the eye moves slowly in one direction and moves quickly back. Patients with nystagmus will find a spot or null point in their field of vision where their nystagmus is minimized. Null points vary from patient to patient — typically they will turn their head down and to one side. It is helpful for friends, family and educators to understand where a child’s null point is and encourage the child to use it. Sometimes there is a stigma involved with how a child with nystagmus will hold their head to look at you, since their null points are usually not straight on. 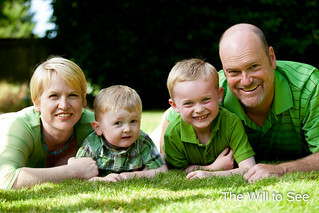 Notice in the photos that Will has his head turned to the side and is looking at the camera out of the right side of his eyes. Nystagmus is not curable. There are some surgical methods and drugs that have been shown to potentially help, but these are not mainstream therapies and aren’t used in most cases. The side effects can often outweigh the benefits of the procedures. We have decided not to pursue any of these therapies for Will’s nystagmus as we were not convinced any would help. For school-age children it is important their teachers are aware of their nystagmus and how to help them. They may need to sit on a certain side of the classroom or close to the front. Large print books, worksheets and large fonts on the computers also help these children. Although people with nystagmus can read small type, it is more difficult and can put more strain on the eyes and brain, prematurely fatiguing the individual. Some children may require additional time to complete tasks, since it can take longer for a person with nystagmus to focus on objects. Nystagmus can be managed with a little bit of understanding and love. It has always been important to us that Will not feel different from everyone else. We explain that he sees differently to other people and show them how to help him. Eventually he will be able to explain to people what he needs to help him see his best and have a good experience through life. I sourced my information from the following sites.